The concept of digital marketing in both B2B and B2C contexts and the fundamentals of digital marketing channels ranging from search, social, to display. How to define digital marketing objectives and KPIs and align them to organisational goals. How to conduct competitive analysis and customer research using digital tools and strategic frameworks. How to implement campaign tracking and identify key digital marketing metrics to measure digital marketing campaign performance. How to interpret digital analytics reports and apply a continuous optimisation framework to improve business performance. This 2-day interactive digital marketing strategy course is packed with real world case studies, industry best practices, and proven methodologies on how to develop an effective digital marketing strategy for both B2B and B2C businesses. Participants will gain broad insight on the most current digital marketing strategies, frameworks, and methodologies practiced by digital marketing industry experts. A range of instructional design methodologies (e.g. Brainstorming & group discussion, case study & problem-solving, concept formation, role-play), integrated with a mix of interactive quizzes and presentation will be used to facilitate and engage the learning experience. Packaged into bite-sized modules, this compact 2-day workshop will provide participants with a comprehensive overview on how corporate companies, SMEs, and industry experts develop and execute tactical and sustainable digital marketing strategies and campaigns. Furthermore, participants will also be given access to a toolkit of templates, checklists, cheatsheets, and e-guides to assist in the development and implementation of an effective digital marketing strategy. Read: What is Digital Marketing and Digital Marketing Strategy? This course is suitable for Marketing Professionals/Managers/Executives (PMEs), Business Owners, and Individuals who are looking to gain a comprehensive understanding of the concept of digital marketing strategy, campaign development and implementation. Basic computer knowledge. Each participant will be provided a windows laptop for the duration of the course. Participants may however opt to bring their own laptops. 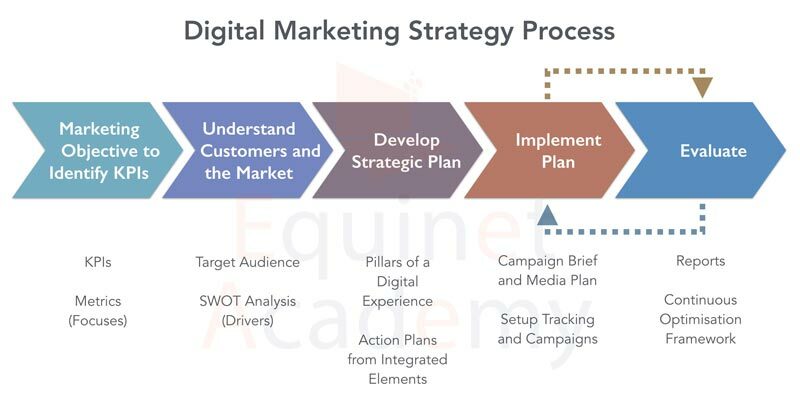 A digital marketing strategy is a blueprint or masterplan to achieve your marketing objectives which involves determining digital marketing key performance indicators, selecting appropriate digital marketing channels, evaluating both traditional and digital marketing performance to improve return on investment, and more. This course provides comprehensive frameworks, proven strategies, and action plans to address the above issues and more. How is this course different from other digital marketing courses in the market? This course provides you with bite-sized, yet comprehensive and actionable digital marketing strategies and tactics that you can implement right after the course. Unlike other Diploma and certification courses, which are packed with assignments and require long-term time commitment, you can get a taste of what digital marketing is all about in two days. From this course, you can then branch out to specialist courses such as Search Engine Optimisation, Digital Advertising, Social Media Marketing, Digital Analytics, and other specialist digital marketing courses. We provide you with life-time access to up-to-date course materials (learner’s guide, slides, templates, and other training resources) which you can still access after the training via the learning portal. You will not sit through hours and hours of dry and tormenting lecture. Instead, you will experience fun and engaging sessions as we apply instructional design learning methodologies such as group discussions, group project work, case studies, interactive quizzes, and hands-on implementation of the concepts learnt. You will be guided by an experienced professional in the field of digital marketing, who will be able to provide you with actionable advice and costly mistakes to avoid, thus shortening your learning curve. You will be provided with additional support after attending the course. Can’t I learn everything online? No doubt there are tons of free information online – free tutorials, guides, and online courses that you can gain useful knowledge from. However, the intangible benefits of attending face to face training include real time consultation with an industry expert, peer to peer learning and interaction, and hands-on practical learning sessions. This will enable you to take away actionable strategies you can implement right after the training. If I have specific questions relating to my digital marketing campaigns, can I consult the trainer? Yes. You may consult the trainer during class and after class. Signing up for this course gains you access to post-training support. Do I have to prepare anything before attending the course? Course materials, a Windows laptop, and WIFI connection will be provided. You may wish to bring a notebook to take notes and a jacket as the room may be cold. Simply click here to sign up for this course via the online course registration form. Once we have received your registration details and payment, we will send you instructions on how to apply/claim funding (if eligible) via email. Upon completion of payment and funding applications, your seat will be confirmed and we will see you in class!